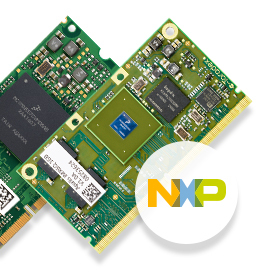 NXP® (formerly Freescale) i.MX application processors are multi-core Arm based solutions. Toradex offers System on Modules (SoMs) based on NXP (formerly Freescale) i.MX 8X, i.MX 8QM, i.MX 6, i.MX 6ULL and i.MX 7 processors. The NXP i.MX 7 processors are ideal for building products for connectivity and IoT applications, as they offer excellent performance/power ratio, advanced security, and heterogeneous asymmetric architecture. The NXP i.MX 6 processors offer scalable performance and multimedia support, along with low power consumption. In general, the i.MX based SoMs can be used to build products for industrial automation, automotive, medical, and many more applications.